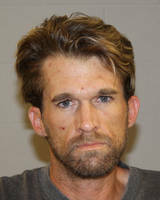 IVINS – The Ivins City Police Department arrested an Ivins City man Wednesday for drug possession. Ronnie Stratton Limb, 31, was arrested and charged with one third-degree felony for drug possession, one class-B misdemeanor for drug possession and one class-B misdemeanor for drug paraphernalia. According to the probable cause statement filed in connection with the arrest, Ivins City Police Detective Nicholas C. Nuccitelli and Officer James Evans observed Limb sleeping in the front seat of his vehicle, which was parked on the 700 East block of 590 South in Ivins. When Limb stepped out of the vehicle, a small Ziploc bag containing suspected methamphetamine fell to the floorboard of the vehicle. A vehicle inventory was then performed, at which point a silver tin box containing suspected marijuana and a tinfoil pipe were found in a toolbox in the truck. Limb confirmed that it was his marijuana. Limb was booked into Washington County’s Purgatory Correctional Facility. According to booking information, Limb’s bail stands at $6,166. Yea it looks like he’s been heavy into drugs alright. He looks closer to 50 than early 30s! Cigarettes will do that to you too. 19+ yrs ago my dh met my younger sister for the 1st time. I had told him that I was the eldest child. When he met her he accused me of not being truthful with him. He said she looked to be about 40 not 24-25. I said she smokes.